Embedded Linux Development goes right to the core of Linux, and learns you how to build small Linux systems for smart appliances and industrial controllers. Android Porting learns you how to build new Android based devices and how to customise Android for your needs. Android App Development learns you how to build Android applications. After this course you will be capable to publish your own applications to the Android Market or write Android Applications for your embedded projects. Kernel Development and Linux Device Drivers explains how the Linux kernel works and how to write device drivers in a very practical hands-on approach. After this course you will be able to write and improve Linux device drivers. Linux Basics and Command line brings you up to speed in Linux quickly. Absolutely a must for those without a UNIX background. The course can be delivered accelerated for those with hands-on UNIX experience. System Administration learns you all the ins and outs to become a full-fledged Linux Sysadmin, with a lot of exercises and all of the important stuff. Linux Scripting is one of the most powerful tools at the hands of Linux Developers and Sysadmins. Being able to tie all the interesting tools together to deliver what you need on time reliably, is what makes Linux such a great operating system. We can really recommend this course to everyone. Perl Programming allows you to do so much with so little code. This cross-platform object-oriented development language is more than just a scripting tool, and that's exactly what you will discover in our course. TCP/IP Services are probably the reason why Linux is looked upon as the swiss army knife of computing and helped the Internet revolution to become a reality. In this course you will learn to configure all the important services and their troubleshooting. Network Administration 2 learns you those things of interest in larger Linux deployments. Security tools, distributed applications and so much more! Samba Integration brings you what is required to integrate Linux professionally in a Windows network environment (Active Directory and Domain Structure). Troubleshooting is a hands-on course with more than 120 real-life troubleshooting scenarios, giving you valuable experience for your operational environment. This course is a new one for Europe and certainly worthy of a recommendation. Especially for those who appreciate hands-on labs! Performance and Security gives you what's necessary to analyse and improve Performance and bring your Security up to a higher level. 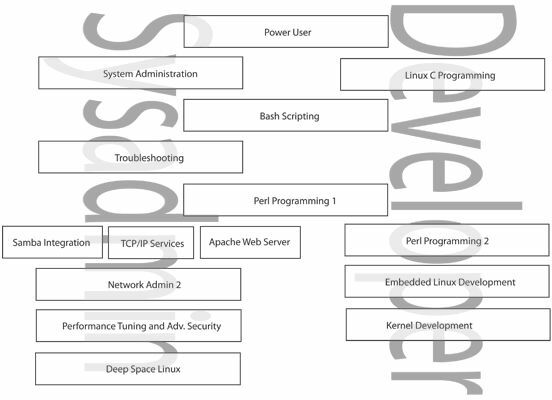 Deep Space is the most advanced Linux course ever developed, requiring at least 5 years of professional Linux experience and looks at all the most complex and technologies considered 'high tech' in the Linux world. With a big focus on Performance, LDAP Integration, Advanced Security topics and Clustering. We have 2 tracks: The 'Linux Network Administrator track' and the 'Linux Developer track'. Both start out with the Linux Basics and Command line training. The entire flow can be seen below. Linux Developers can follow after that directly the Embedded Linux Development course if that's their focus of interest. The Linux C Programming course can be followed before or after that course. The Linux Scripting Course and Perl Programming Course are independent of that too. The Kernel Development course has both the Embedded Linux and the Linux C Programming courses as prerequesites. Linux Network Administrators start out with the Linux Basics and Command line, then they advance to the System Administration course. Both courses allow them to advance their LPI Certification level. The Linux Scripting course will allow them to increase the productivity by learning better how to automate tasks in Linux. The Troubleshooting course confronts experienced system administrators with hunderds of hands-on scenarios in which the Linux system is broken. Advancing in Samba integration with Windows, the Apache Webserver and Linux Network Administration deepens the knowledge of the Linux System Administrator. After which Linux Performance Tuning and Advanced Security is our most advanced course for the seasoned Linux Network Administrator. Our classes are delivered in Dutch, French and English, depending on the language of the participants; in English in the case of a mixed language group. Our course materials and exercise materials are in English. We are Linux distribution independent, which means that our courses can be followed with a choice out of RedHat/Fedora, SuSE or Debian/Ubuntu distributions. Linux distribution specifics are indicated as such. It is our experience that organisations and individuals tend to change between Linux distributions over time and some organisations mix different distributions as well. We also believe it gives a greater insight into the operating system as a whole. Our classes are organised in our offices in Brussels, Diegem (close to Brussels Interational Airport in Zaventem - access map). Courses can be organised in other locations such as Gent, Antwerp, Charleroi, Leuven, Namur and Hasselt or at your premises upon request. Copyright 2001-2013, Linux Belgium. All rights reserved. Linux is a trademark of Linus Torvalds.